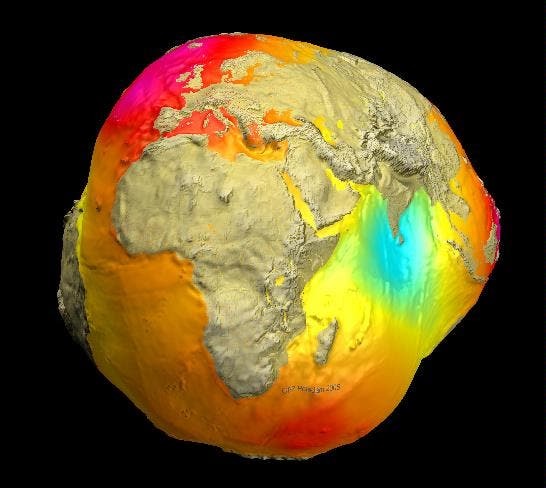 This new gravity field model is based on measurements of the satellites LAGEOS, GRACE and GOCE. These were combined with ground-based gravity measurements and data from the satellite altimetry. EIGEN-6C has a spatial resolution of about 12 kilometres. Compared to the last version of the Potsdam potato, this is a four-fold increase. "Of particular importance is the inclusion of measurements from the satellite GOCE, from which the GFZ did its own calculation of the gravitational field' says Dr. Christoph Foerste, who together with his colleague Dr. Frank Flechtner directs the gravitaty field work group at the GFZ. The ESA mission GOCE (Gravity Field and Steady-State Ocean Circulation Explorer) was launched in mid-March 2009 and since then measures the Earth's gravitational field using satellite gradiometry. "This allows the measurement of gravity in inaccessible regions with unprecedented accuracy, for example in Central Africa and the Himalayas" adds Dr. Flechtner. In addition, the Earth's gravity field in the vastness of the oceans can be measured much more accurately with GOCE than with previous satellite missions such as GFZ-CHAMP and GRACE. Among other advantages, this allows a more faithful determination of the so-called dynamic ocean topography, i.e. the deviation of the ocean surface from the equilibrium with the force of gravity. This ocean topography is essentially determined by ocean currents. Therefore, the gravity field models calculated with GOCE measurements are of great interest for oceanography and climate research. Besides GOCE, long-term measurement data from the twin-satellite mission GRACE (Gravity Recovery and Climate Experiment) of the GFZ were included in the new EIGEN-6C. GRACE allows the determination of large-scale temporal changes in the gravitational field caused for example by climate-induced mass displacements on the Earth's surface. These include the melting of large glaciers in the Polar Regions and the seasonal variation of water stored in large river systems. Temporal gravity changes determined with GRACE are included in the EIGEN-6C model. The new Potsdamer potato is for the first time no longer a solid body, but a surface that varies over time. Particularly in order to record these climate-related processes for the long term, a follow-on mission for the GRACE mission that ends in 2015 is urgently needed.